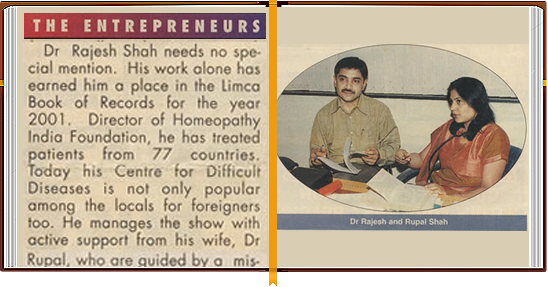 The only Indian doctor to feature in the Limca Book for a record of treating patients in 77 countries and then breaking his own record by spreading to over 92 countries. The only homeopath who advises on personal health-queries to patients from over 150 countries explaining to them the role of homoeopathy. The only homeopath who set up over 14 websites devoted exclusively to homoeopathy. Physicians are used to getting phone calls in the middle of the night. And rare is the dinner that isn't interrupted by a cell phone. 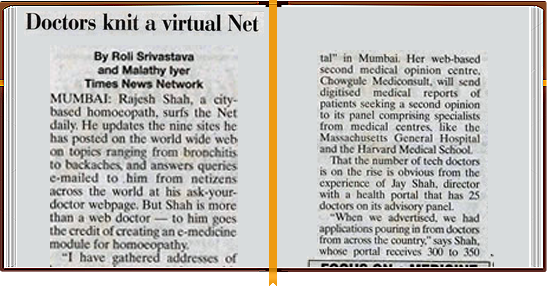 For Mumbai-based Dr. Rajesh Shah, however, the emergency summons is just as likely to be through email... from anywhere in the world. 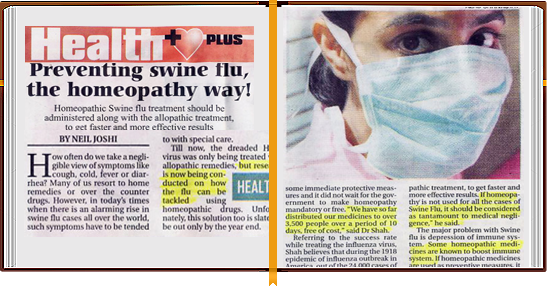 Preventing Swine Flu, the Homeopathic way! Rajesh Shah, a city-based homoeopath, surfs the net daily. He updates the nine sites he has posted on the world wide web on topics ranging from bronchitis to backache, and answers queries emailed to him from across the world. But Dr. Shah is nore than a web doctor. 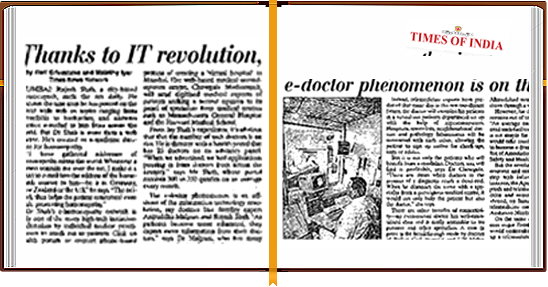 He's created an e-medicine data base for homoeopathy. MRS. PRASANNA, a 57 year-old from Hyderabad, had been suffering form severe migraine headaches since many years. She tried many allopathic medicines but without any considerable benefits of respite. Her son Madhu, a software engineer with Microsoft in San Diego was obviously concerned. Dr Rajesh Shah needs no special mention. His work alone has earned him a place in the Limca Book of Records for the year 2001. 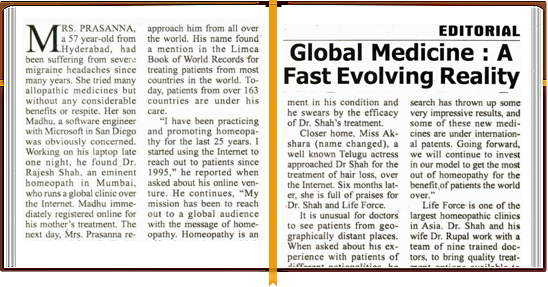 Director of Homoeopathy India Foundation , he has treated patients from 77 countries . 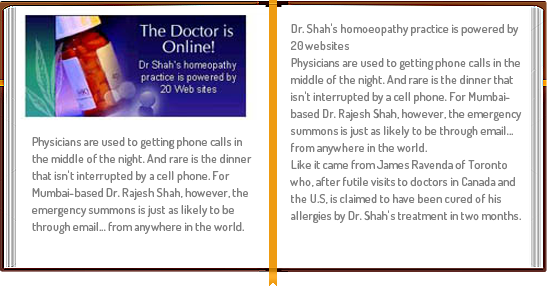 Rajesh Shah, a city based homeopath, surfs the Net daily. He updates the nine sites he has posted on the world wide web on topics ranging from bronchitis to backaches and answers queries e-mailed to him from netizens across the world at his ask your doctor webpage. 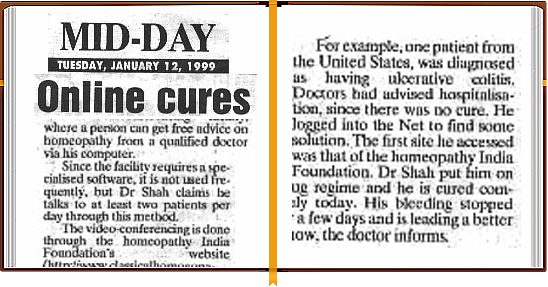 But Shah is more than a web doctor - to him goes the credit of creating an e-medicine module for homeopathy. 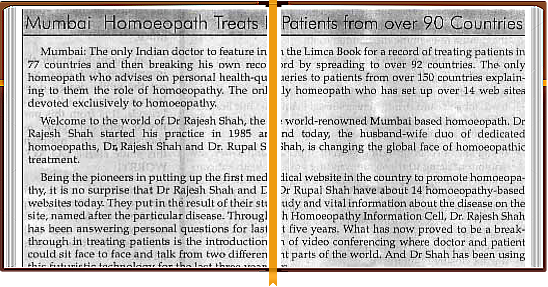 A WEBSITE launched by Dr Rajesh Shah three years ago had now been updated with video-conferencing facility, where a person can get free advice on homeopathy from a qualified doctor via his computer.